I don't often have need for a jeweler, because I'm not really a jewelry person. However, after perusing the beautiful creations offered at Jones and Jones Jewelers (7858 S.W. Capitol Highway), I might just become one. My reason for stopping by the shop in Multnomah Village was that I had a piece of jewelry I needed to have repaired. But while owner Thomas Jones was examining my piece — an engraved, U.S. Air Force ID bracelet from World War II given to my husband by his father — my attention was caught by the gorgeous rings, bracelets, necklaces and earrings sold at the shop, most of which are designed by Jones, his wife Janet or colleague Kim Allen. 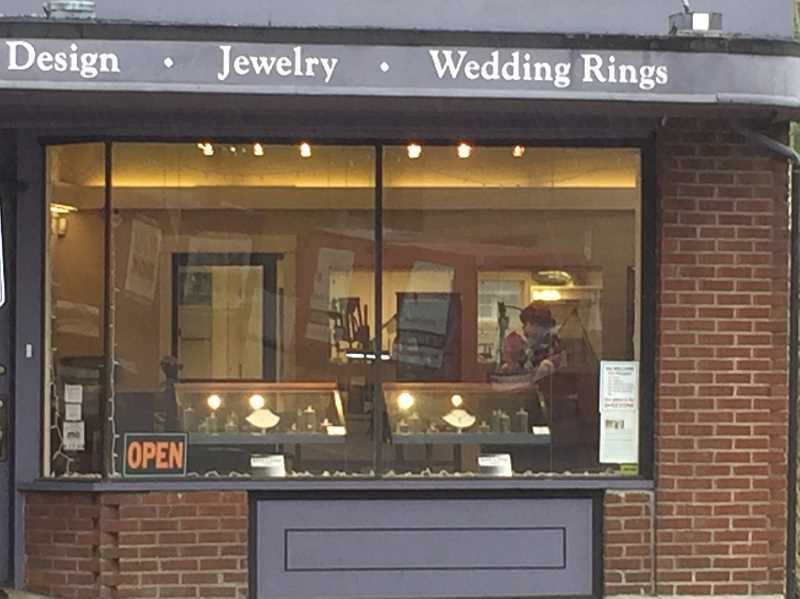 As I continued to look around the store, I noticed both traditional and modern-looking pieces, all exquisite, and many breathtaking engagement rings that made me wish my brother hadn't already bought a ring for his fiancee. Since I don't know what jewelry of that caliber should cost, I can't really comment on the prices. And actually, I must confess, I didn't really check because I'm not in the market to buy at that moment. And yet, I am sure a person who was looking to purchase original, quality jewelry, would be thrilled with what they can find at Jones and Jones. I did find myself fantasizing about receiving one of the pairs of simple, stud earrings of sparkling gems that I saw — or perhaps a delicate pendant — for my wedding anniversary. Maybe I will whisper a hint in my husband's ear. But back to reality: As I was chatting with Jones, I learned that he's been in business for 40 years. He moved his shop from downtown Portland to Multnomah Village six years ago. He said he really enjoys the friendly atmosphere in the Village, and how the other shop owners there — as well the customers, of course — form such a close and supportive community. One of the services Jones and Jones is particularly known for is its custom design. The shop will work with you to create a piece of jewelry that is truly unique, whether it's with stones from an heirloom that you'd like to have reset, or you're starting completely from scratch. I happen to have a beautiful, original ring that my father had designed for me at a local jeweler in the town where I grew up — incorporating my birthstone and a small diamond — that my parents gave me for my college graduation. They did the same for each of my sisters. Too many years later than I care to reveal, I still wear that ring, as I have since the moment I put it on. I still love it, and still get many compliments on it. Jones and Jones will do the same for you, providing you or your loved one with a one-of-a-kind piece to wear and treasure forever. And what really adds the icing to the cake is that they use recycled precious metals in their work and only conflict-free diamonds. It makes sense to me that if you're looking for something out-of-the-ordinary and locally-made, rather than what the big-chain jewelry stores stamp out, you would take the time to go in and see all the loveliness that Jones and Jones has to offer. The shop is open Wednesday through Friday from 11 a.m. to 6 p.m., and Saturday from 11 a.m. to 5 p.m.